Happy hump day to you my friends! Today I am taking a very special friend out to lunch for her birthday and this is the card I made for her... I stamped four square panels with a flower and leaf image from In Bloom, detailed the flower centers with french knots. Punched the bottom edge of the purple panel with the Fiskers Upper Crest Border Punch, stamped the sentiment and wrapped it with white floss. 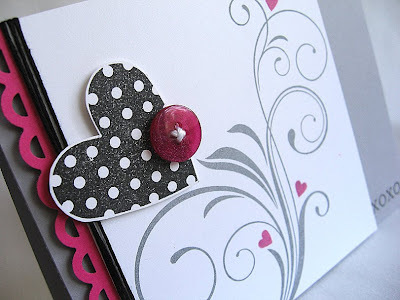 Stamped white tiny polka dots, from Polka Dot Basics II, on the card base. I hope she likes it, I know she likes purple and my cards with the square panels are her favorite. Something I like to do when giving cards out is to write out the message on a piece of white computer paper then lightly tack it into place on the inside. That way the message can be easily removed and the receiver can reuse the card. Hope you all have a wonderful Wednesday! Thanks so very much for visiting me to day! Hello my friends and happy Tuesday to you all. I went with my With Sympathy stamp set, I haven't used this one in a while. 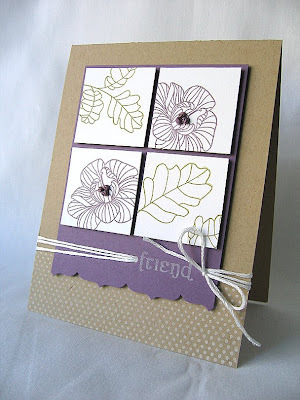 Stamped the vine image in moss and incorporated the other colors for the challenge through the flowers. 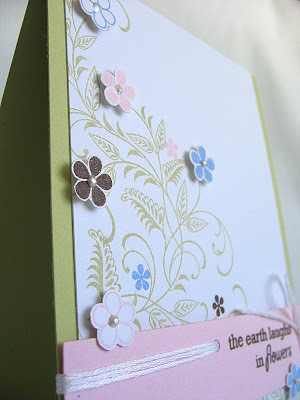 The tiny flower image was stamped directly onto the white cardstock. The larger flowers were stamped then cut out and attached with dimensional adhesive. 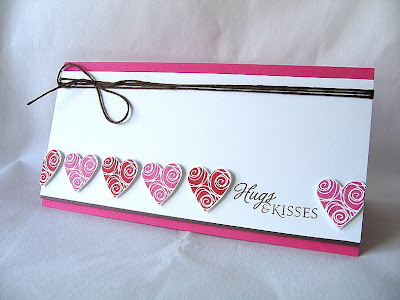 The sentiment was stamped onto a pink strip, punched holes on either side, strung the floss through, wrapped it around the card and tied it off into a bow. Finished off the card with some Liquid Pearls in the center of the flowers. It sure is a nice day in my neighbor hood today, the temperature has finally gone down (it's a cool 68 deg). They say its supposed to get cooler as the week progresses, yeah it finally feels like fall is actually here! Glad you stopped by today! I do hope you enjoyed your visit. Hello my friends! I hope you all had a great weekend! Well, that's all from me today. I hope you all have a great start to your week! Thanks for stopping by today. These cards measure 4 1/4" X 2 3/4". This is my second post today, so please scroll down to see the first. I chose to reuse three different packaging materials to create my flower... the corrugated cardboard, the kraft colored packaging paper and the cream colored packaging paper. I cut all three using my Blossom Nestabilities, stamped the cream paper with red polka dots, and tied them all together with a button and a twine knot. Can't wait to see what everyone else created! Thanks for hopping by, I hope you enjoyed! Hello my friends! Sorry to have left you hanging yesterday. I had an extremely busy day and before I knew it, it was over. So onto the card... 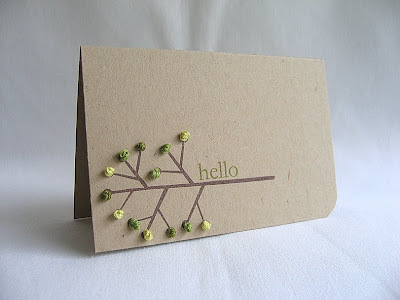 I stamped my favorite tiny polka dots from Polka Dot Basic II and a vine from Beyond Basic Borders, in Ocean Tides ink, onto my 5" X 5" kraft card base. Straight stitched twine across an Upper Crest border and a torn edge. Here are a few tips I found helpful when stitching with hemp twine... It helps to use the thinnest twine you have or can find (like jewelry twine). Pierce your holes but make them a little larger so the twine will fit through (it help to rotate the piercing tool when inserted into the hole). Then thread the twine by hand, it's usually stiff enough to do so, but make sure to keep the end clean (cut off the end if it becomes frayed). So if you give this a try I hope you find this info helpful. Next I layered on the flower, which was created using my Blossom Nestabilites, then rounded the corners. I'm sure you all are ready for the weekend, got any big plans? We have two more birthday parties to go to, this has been a very busy birthday month for us but its been fun. My hubby is home today so I better get going and spend some quality time with him and our little man. Hope you have a fun weekend! Thanks for stopping by! Hello my friends! 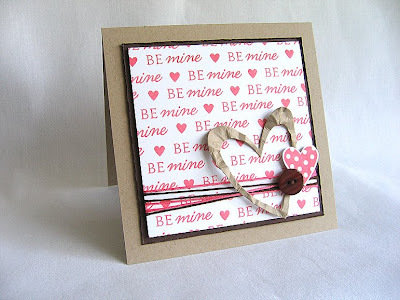 I know Valentine's Day is a long ways away, but when I made this card last week I made today's card as well (since my Heart Prints stamp set was already out). 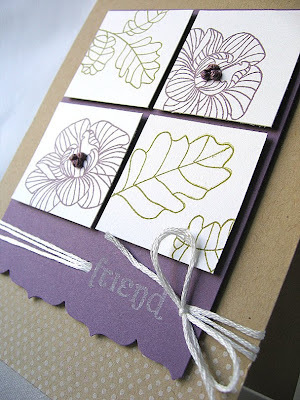 When creating today's card I was inspired to play around with the sentiments and make some hand stamped pattern paper. The "Be Mine" and the small heart are separate images. So to make things go faster, I adhered them next to each other, on my acrylic block, and then stamped away. 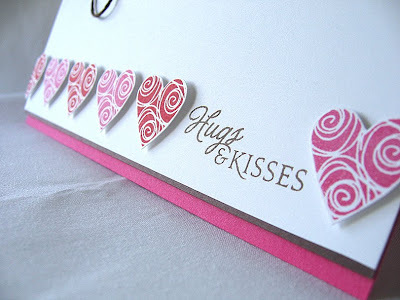 The large heart was die cut from kraft cardstock and then crinkled, the small heart was stamped in berry sorbet. Wrapped the patterned paper with berry and brown floss and tied it off with a brown button. 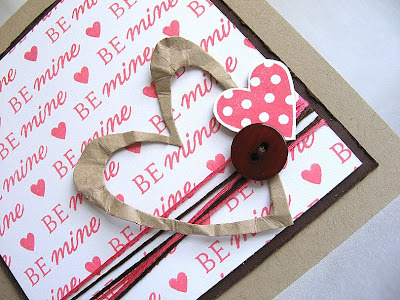 Accessories: Dark Choc Vintage Button, DMC Floss, Cuttlebug Heart Dies, Edge Distressing Tool. This time the challenge was to create something that incorporates some kind of household item as the focal point. My first card uses the bike image from PTI Everyday Button Bits... To create the wheels, I punch circle from grey cardstock and then stitched the blue buttons on top of the circles. "Enjoy" was stamped in grey ink onto an orange punched circle and adhered behind the main image and ribbon. The rest of the sentiment "the ride" was stamped in cream ink at the bottom of the card. 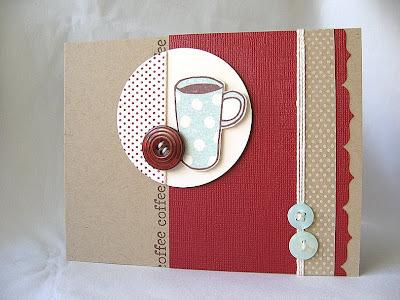 The second card uses a coffee cup from PTI Warm Happiness. This is a new color combo to me. I had scraps of Aqua, burgundy, brown, kraft and cream laying out on my work space and thought they looked very pretty and warm together, perfect to pair with Warm Happiness. Using my new border punch on this one, Upper Crest by Fiskers. I have been looking and looking for this one, dying to get my hand on it. The day I finally found it I almost didn't see it. It was in the wrong spot and behind other punches, I had been very desperate by this time and decided to look through each and every border punch. Good thing I did, I would have never seen it if I had not. Anyways, onto the card... 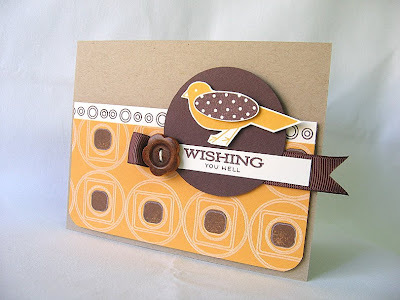 Stamped the circle and kraft strip with the tiny polka dots from PTI Polka Dot Basics II (I just love those little guys! He,he!) in burgundy and cream inks. The buttons were strung onto the twine and then I wrapped the twine around the card and the circle, held it in place with tape on the back side of the circle. Boy am I cutting it close on this one, the deadline is at the end of the hour! Oh, thank you all for your wonderful comments on my Embellish Challenge card. I really had a lot of fun making that one and it really means so much that you all are enjoying it too! I hope you all have a chance to participate. Thanks for visiting today, hope you enjoyed! Accessories: Dark Choc & Aqua Mist Vintage Buttons, Twine, Fiskers Upper Crest Border Punch & Circle Punch. Hi my friends, hope you had a great weekend! 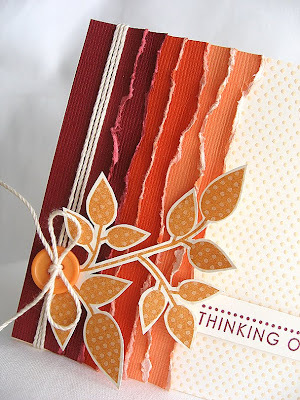 Using burgundy, orange and light orange cardstock, tearing and distressing the edges, then layering, I created a neat gradient color effect. 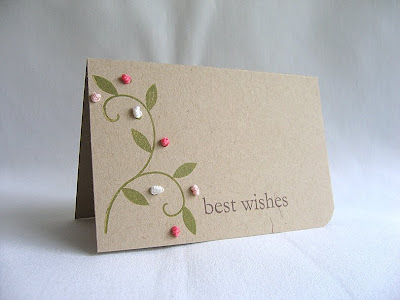 I stamped and heat embossed the cream card base with tiny polka dots, from Polka Dot Basics II, in clear embossing powder. The embossed dots are such an awesome detail, I really LOVE the way it turned out! You have to try it! Click on the photo for a closer look. Wrapped the edge with twine and tied with a button. Layered the leaves, from Beautiful Blooms that were stamped in orange then with cream polka dots, under the button. 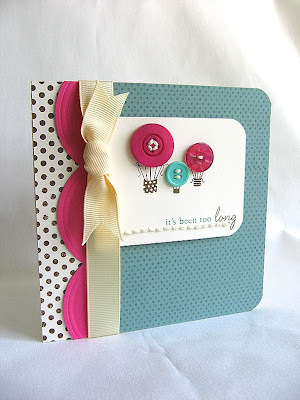 I chose this sentiment, from Men of Life, for the card because of it's polka dots (after all this is a polka dot challenge too). Then finished the card off with two more buttons and rounded the bottom corner. I am really happy with the way it turned out! ETA: The latest challenge over at the Moxie Fab World Blog is Gradient Is Radiant, gradient which is achieved by color changing gradually. 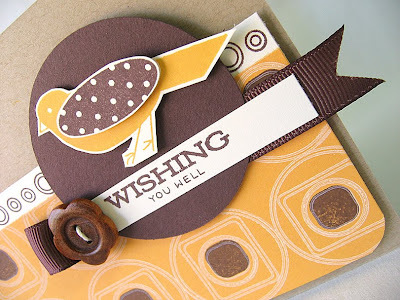 What a coincidence, a couple of days after I posted this card this new Moxie Fab Challenge was posted and I already had the perfect card to post. Stop on by and check out the other fabulous creations that have been submitted and give it a try your self. Thanks for stopping in today, I hope you enjoyed your visit with me today. Hello my friends and happy Friday! Just playing around some more with my Heart Prints stamps set, I really don't use this set enough. The color gray is something I don't use often enough either. I love how it adds a softness to the color combo. 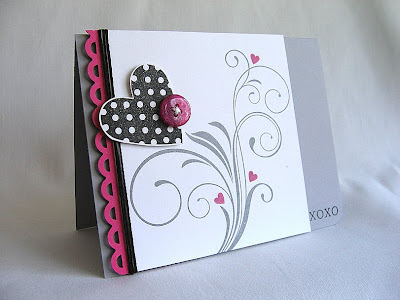 The card is created with a gray card base, the flourish was stamped in gray ink and then added a few tiny hearts in raspberry ink. Attached a raspberry apron lace border and wrapped it with black floss. 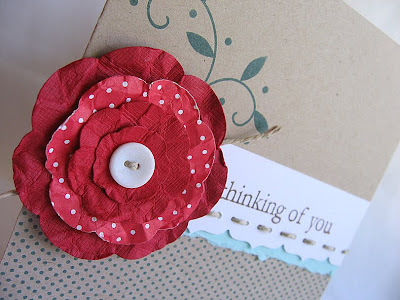 Embellished the card with a polka dot heart, button and twine. Then finished it with a "XOXO" in the rounded corner. So what do you think... Could this pass as a wedding card for the CAS32 Challenge? Did you see the new Polka Dot Paradise Color Challenge over at Embellish Magazine? What a fabulous color combo! I do hope to give it a go today. I've decided to make the best of a weekend spent at home (instead of camping) and create! We will probably take a day trip to somewhere on Saturday. Anyways, hope you have a fun weekend! I'm very glad you stopped by today, hope you enjoyed! 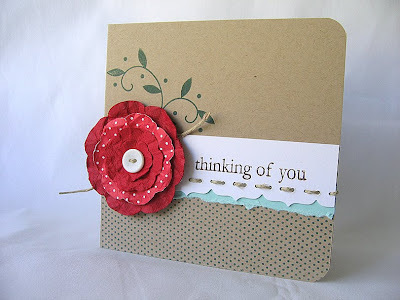 Today I wanted to share a card I created for the latest CAS Challenge: To create a wedding card... 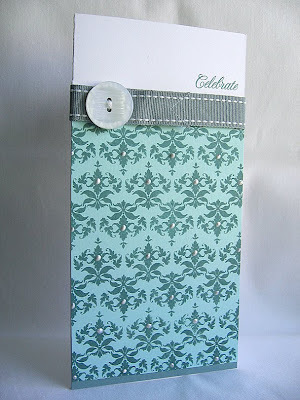 The damask image was stamped in Ocean Tides ink onto Aqua cardstock then embellished with liquid pearls. To wrap the ribbon around the card, I first had to cut a slit in the fold of the card. Threaded the ribbon through and held it in place with a glue dot, then stitched the button on (through the ribbon and card base) for extra strength. So today was supposed to be the day we leave for our camping trip, but unfortunately something has come up with my husbands work that has caused us to cancel our trip. Bummer!!! I was really looking forward to it. I am really trying not to be too bummed about it, the Lord must have other plans for us this weekend. Thanks for stopping by today. I hope you have a great rest of the week and a fun weekend! Accessories: White Vintage Button, Twine, Stitch GG Ocean Tides Ribbon & Ranger Liquid Pearls. 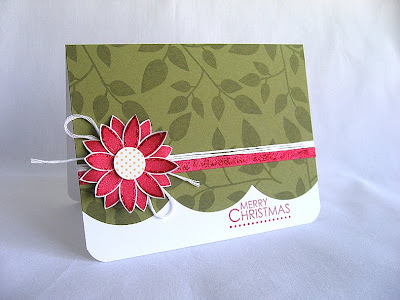 Stopping in today to share a fun Christmas card with you today... Definitely a non-traditional color combo, but yet fun! I stamped the ornament image, from Hero Arts Holiday Messages stamp set, in ripe avocado and berry sorbet. Punch them out with my small circle punch and attach every other one with dimensional adhesive. Added a touch of glitter to the scalloped edge and to each of the ornaments. Finished the card with a rounded corner, sentiment and one last hanging ornament. I've been busy packing for another fun trip, this time to go camping for a few days. We will be leaving on Thursday, but I hope to schedule a post or two while away. Hope you enjoyed your visit and thanks for stopping by! Happy Monday to you all! Hope you had a great weekend! I had a very busy weekend so no crafting time for me. So today's card was one I had created sometime last week. 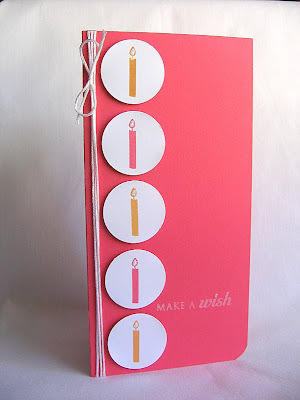 Using one of the single candle images from PTI Cupcake Collection, I stamped and punched a few candles out. 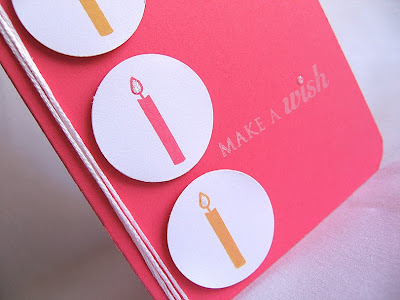 Popped them onto the card with dimensional adhesive, wrapped some floss, stamped the sentiment (in craft white ink), rounded the corner and embellished the candle flames with my stardust stickles. So we had a busier than usual weekend. We hit the beach on Saturday, it was overcast but we still had fun. Then visited with family, my cousin and his little family were visiting from Eastern Canada. Sunday was the PPS birthday party (Princess, Pony & Superhero) and my son had a blast, he did not want to get off of the pony. Anyways, enough about me. I hope you enjoyed the card and thanks for stopping by! Happy Friday friend!!! The weekend is just about here! So onto today's card... I don't think I've ever played with this color combo before (Ocean Tides, Raspberry Fizz, Dark Chocolate & Vintage Cream), but I really like it! Playing with a new card size too, this card measures 5" X 5". I was inspired by the new envelope sizes Papertrey Ink is now carrying. I don't have any yet, but plan on ordering some with my next order (when ever that is... he,he). I was a little polka dot happy on this card, but I think it makes for a fun card. 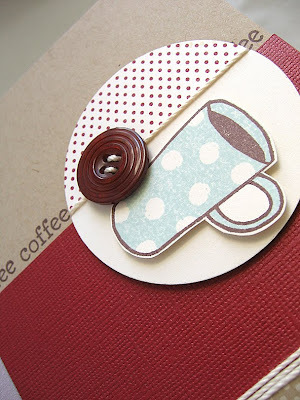 The polka dots on the ocean tides cardstock are stamped in versamark and in dark chocolate on the cream. 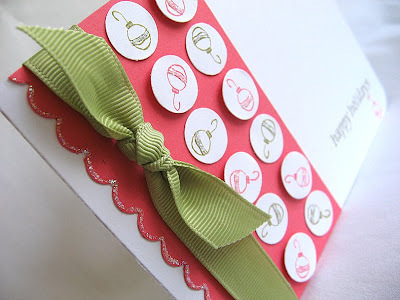 Added a bright raspberry scalloped border with my Embossed Curves Border Punch and wrapped the card with cream ribbon. Emphasised the sentiment and stitch the buttons, onto the brown balloon baskets, with some cream twine. Rounded the corners of the image panel and card base and called it done. I'm ready for the weekend, how about you? We are headed to the beach, for a quick day trip, to play and meet up with family. Then we have a fun Princes, Pony and Super Hero (that's a mouth full) birthday party to go to. My little man will get to dress up as Spiderman and ride a pony, it doesn't get any better than that! Fun, fun! Hope you have a wonderful Friday and a fun weekend! Thanks for stopping by! I'm back with a card to share with you today. 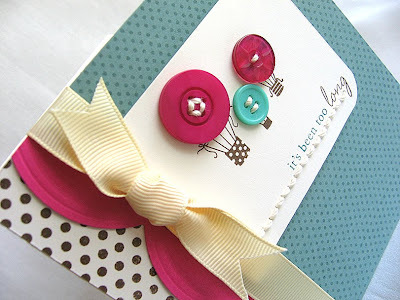 For this card I had played around with some goodies I had received earlier from Lynette, you can see them here. 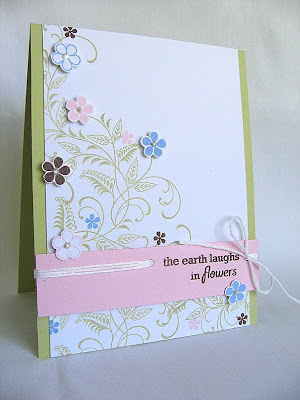 To creat my focal image I stamped the flower stems then punched them out using my circle punch. Instead of adding buttons I used brads as my little flowers. Stamped some polka dots on the green panel in Versamark, stitch a row of white floss and added one last brad. I am really happy with the way the sentiment came out, it just took me a few tries to get it right. :) I knew I wanted part of the sentiment to pop with white, so the first thing I tried was stamping the first part in green, then the "love" in craft white ink. That didn't stand out enough, so the next option was to heat emboss with white embossing powder. I tried this on a scrap piece of cardstock first to see if it would work and it turned out fine. But when I tried it on the final piece, it of course didn't turn out. So to cover up the mess I stamped "love" in green, on white cardstock, and punched it out with my small circle punch, popped it on with a dimensional, and it was perfect. I love it when mistakes lead you to the perfect solution, I mean... Why did I not think of that first?! Ha,ha! I guess this card would also work for the latest CAS challenge, to Pop It Up. I think I'll stop by SCS an post it over there too. I hope you enjoyed your visit with me today and have a wonderful Thursday! So sorry, but I do not have a card to share with you today. However... 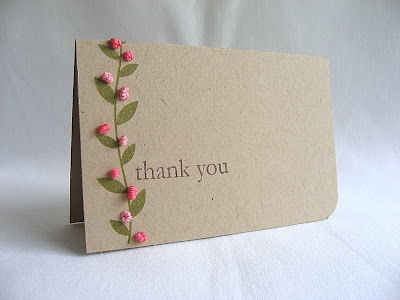 I did want to say a big Thank You to Cath Edvalson of the Moxie Fab World Blog. I am truly grateful, honored and extremely excited that she had chosen my Peace Card as a winner for the Stretch Your Holiday Style: Classy & Elegant Challenge. Thanks to all of you for your wonderful comments and kind words regarding this honor and for each of my other challenge submissions, you are all too kind. I'll be back tomorrow with a card. Hope you all have a wonderful rest of the day! 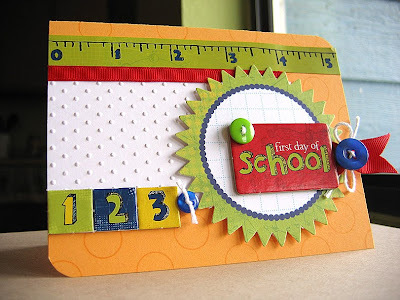 This weeks CAS Challenge is Pop It Up, to use dimensionals/pop dots on your card. Here is what I came up with... I pulled out my neglected PTI Heart Print stamp set for this one. Stamped and cut out each heart and popped them up with dimensional adhesive. Super simple! This challenge was a breeze, adding dimension is something I do on every card. It's always a fun detail to add. Thanks for stopping by today, hope you enjoyed. Hello all and Happy Labor Day (to you US Folks). Still painting our house and should be done today. 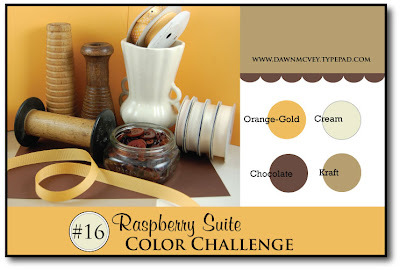 I just wanted to pop in and make a quick post to share my card for Dawn's Raspberry Suite Color Challenge. Hope you all have a wonderful Monday. Sorry this post is so short. Yes... this is another Christmas card. I wasn't completely satisfied with my first creation for the Moxie Fab Stretch Your Holiday Style: Stamping Challenge, so here is my second try... For this card I used very traditional colors, but... the stamps used (except for the sentiment) were not your usual Christmas stamps. The leaves and flower are from the PTI Beautiful Bloom set and the polka dot flower center is from PTI Polka Dot Basics II. The leaves were randomly stamped with Versamark. 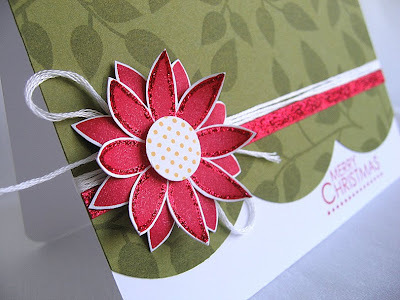 The flower (or my version of a Poinsettia) was stamped twice then cut out and layered with dimensional adhesive. To give the flower some extra dimension, I curled the bottom flower leaves (with a pencil) down and the top layer up. Then added a touch of red glitter. So what do you think of my Poinsettia? It was my inspiration for the card. I'm sure you all are ready for the Labor Day weekend, got any big plans? We are looking to get more painting done, this time on the outside of our house. Well, what ever you have planned, I hope you have a great time this weekend. One last thing (I'm sure you all are aware) but I just wanted to give you a link to an exciting and innovative new venture that Ashley Cannon Newell, her husband McArthur, Sarah Martina Parker and Charlene Austin are jumping into. It's called Embellish Magazine and it's an eco-friedly, challenge-based online publication for you to get involved in and potentially get published in! So stop by and check it out! Today I though I would share a couple of cards that were published in the August 2009 issue of CARDS Magazine. So if you haven't seen them yet here they are... 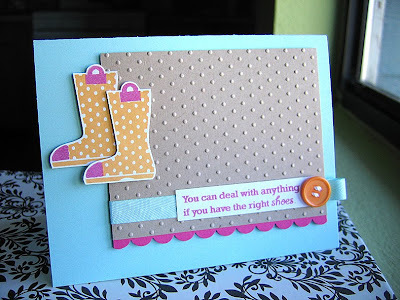 These cute boots and the sentiment are both from the PTI Green Thumb stamp set. 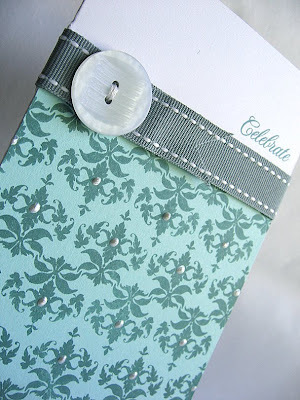 The card below uses mostly Scenic Route goodies and PTI Polka Dot Basics I. CARDS Magazine is a fabulous publication, it's always full of great creations and inspiration. If you haven't seen it yet I highly recommend taking a look, you will definitely be pleased! They have issues available online as well, and the October 2009 online issue is already available now for your viewing pleasure. I hope you enjoyed the cards and as always... thank you for stopping in today!!! Something Other Than Christmas and Goodies! It's time to give the Christmas Cards a break! So here is a simple birthday card I have to share today... It's based off the same layout as this card. Just changed the colors around and used a different image. This is such a versatile layout, you could pretty much use any image you choose. Just add a few fun details to the image and your good to go! I also wanted to share these wonderful goodies with you too. Lynnette was kind enough to send all of this to me in exchange for some stamped Everyday Button Bits images. 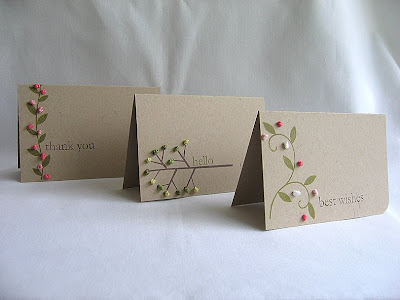 She is so very generous and is a very talented card maker as well. Please check out her blog and fabulous work, your sure to enjoy! It amazes me how many new friends I have made through this blog, you all have been a blessing to me! 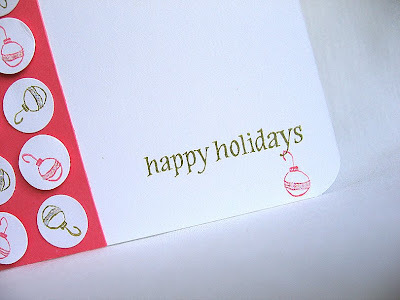 The last Sketch Your Holiday Style Challenge over at the Moxie Fab Blog is A Stamping Challenge. I used the same stamp set as on yesterday card except I stamped the snowflakes in cream onto kraft cardstock. Punched the top with my apron lace border punch then added a torn edge and some floss. 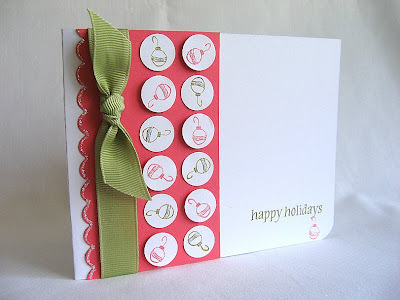 Finished the card off with a rounded corner, stamped sentiment and some pearls added to the center of the snowflakes. 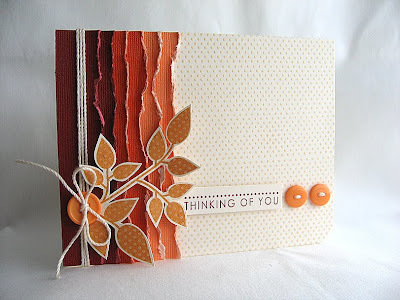 I think I'm going to give this challenge another try, as I was posting the link to the Moxie Fab blog I realized that this card was kind of similar to Maren Benedict's Think Snow Card. So I want to create something different. Funny how that happened, I wasn't even thinking of her card when I created mine. The new DT for the CAS Challenges has been posted. I didn't make it this time but the ladies that did are very talented ladies and have galleries full of fabulous work! I can't wait to see what they create! I got a nice surprise yesterday... My hubby brought home a new laptop computer. It's so nice and fast, our other computer is out dated and very slow. So now I can work at a faster pace making more time for the family and at the table instead of in the back room shut off from them. Well, thanks for stopping by today. Hope you have a fun day!